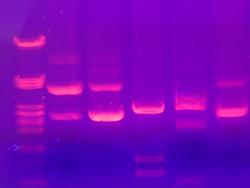 Agarose gel electrophoresis separates DNA fragments according to their size. Typically, a DNA molecule is digested with restriction enzymes, and the agarose gel electrophoresis is used as a diagnostic tool to visualize the fragments. An electric current is used to move the DNA molecules across an agarose gel, which is a polysaccharide matrix that functions as a sort of sieve. The matrix helps "catch" the molecules as they are transported by the electric current. This technique has lots of applications. Generally speaking you can analyze DNA fragments that result from an enzyme digestion of a larger piece of DNA to visualize the fragments and determine the sizes of the fragments. 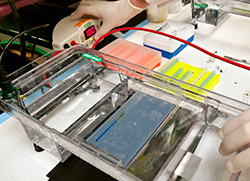 In addition to its usefulness in research techniques, agarose gel electrophoresis is a common forensic technique and is used in DNA fingerprinting. Ethidium bromide is an intercalating dye, which means it inserts itself between the bases that are stacked in the center of the DNA helix. One ethidium bromide molecule binds to one base. As each dye molecule binds to the bases the helix is unwound to accommodate the strain from the dye. Closed circular DNA is constrained and cannot withstand as much twisting strain as can linear DNA, so circular DNA cannot bind as much dye as can linear DNA. Ethidium bromide can easily get into your cells. Human DNA is linear and stains well. This means that it can get into your DNA and untwist it. This is not a good thing, so make sure you are careful and protected when using ethidium bromide. There are also safer and less toxic alternatives that you may be able to use. GelRed and GelGreen are DNA stains that cannot pass through cell membranes, making them safer to use and dispose of. The phosphate molecules that make up the backbone of DNA molecules have a high negative charge. When DNA is placed on a field with an electric current, these negatively charged DNA molecules migrate toward the positive end of the field, which in this case is an agarose gel immersed in a buffer bath. The agarose gel is a cross-linked matrix that is somewhat like a three-dimensional mesh or screen. The DNA molecules are pulled to the positive end by the current, but they encounter resistance from this agarose mesh. The smaller molecules are able to navigate the mesh faster than the larger one, so they make it further down the gel than the larger molecules. This is how agarose electrophoresis separates different DNA molecules according to their size. The gel is stained with ethidium bromide so you can visualize how these DNA molecules resolved into bands along the gel. Southern blotting may also be used as a visualization technique for agarose gels. Unknown DNA samples are typically run on the same gel with a "ladder." A ladder is a sample of DNA where the sizes of the bands are known. So after you run out your sample, you can compare the unknown fragments to the ladder fragments and determine the approximate size of the unknown DNA bands by how they match up to the known bands of the ladder.